American Airlines has reversed its decision to deny a refund on the ticket of a 9-year-old St. Charles girl who died. The decision came after our first report on Tuesday and a flurry of comments online. The Cantrell family lost their daughter “Scout” to an asthma attack and cardiac arrest last fall. 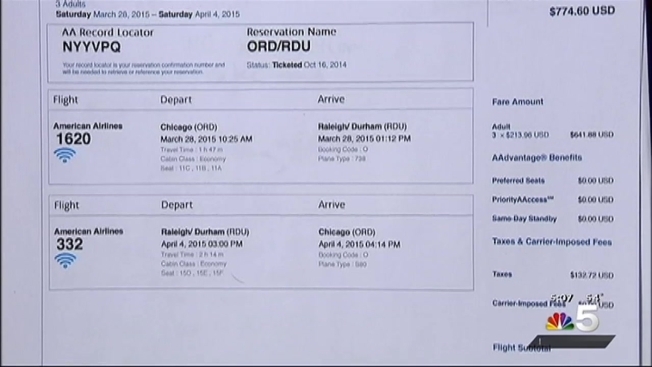 They turned to NBC 5 Investigates after American Airlines would not refund their daughter’s ticket. After Scout’s mom, Felicity Cantrell, posted the story on social media, outraged comments followed. Within hours, American Airlines replied on social media and to NBC 5 Investigates that the situation was resolved and the ticket refunded. The Cantrell’s say they were never notified. An American executive called the family Wednesday, two days after the social media storm started, apologized and confirmed the refund. The company also acknowledged the refund should have happened immediately, back in November, when the family privately asked for this action.